When you see grass on the face of your irons, do you immediately brush it clear without a thought? After teeing off, do you ever check the sole of your driver for marks? If not, you're ignoring telltale signs holding valuable info about your swing. Whenever grass is stuck between club and ball, the resulting spot on your clubface will be precisely where the ball was struck. You may think you hit the shot flush, only to find the mark on the club's toe or heel. The same applies to any shot hit using a tee. Turn the club over – whether it's a driver, hybrid, wood or iron – and look for paint left by the tee, then match the line with the clubface. That will tell you where contact was made. Over time, many marks will accumulate on the bottom of your driver, so clean it off from time to time so you'll be able to distinguish a just-made streak from an older one. If you discover a consistent pattern to your contact – consistently hitting shots off the heel, for instance – refer to the “Causes and Cures” tips at Golf-Info-Guide.com. Using the search function, type in a phrase such as “cure heel contact,” and a list of helpful tips will appear on the screen. Golf is full of clues that can help you identify and fix swing problems. You just have to know where to look. When trying to improve at golf, you can't afford to miss any opportunities. This is one of the most difficult games in the world to play at a high level, so no stone should be left unturned as you work to elevate your level of play. One of the keys to developing your golf game is a willingness to pay attention to even the smallest of details. If you only pay attention to the 'big' things while ignoring everything else, it will be nearly impossible to improve. In this article, we are going to discuss something that seems like a small point, but it is actually quite important in the overall scheme of your game. We are talking about using the evidence left on your golf club after a shot to evaluate the quality of your swing. Most golfers don't think twice about what is left behind on their club after the ball is sent off into the distance. They simply wipe the club off, stick it back in their bag, and move on. However, if you take just a moment to review what has been left behind on the club head, you may actually be able to make big strides forward with your swing. 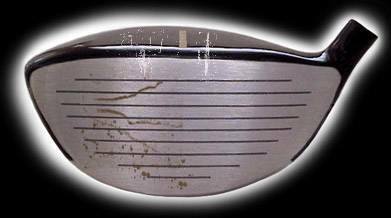 Generally speaking, there are two kinds of marks which may be left behind after you hit a shot. As one possibility, there may be grass smashed up against the face of the club. This is usually the case when hitting an iron shot from the rough, although it may happen from time to time when playing from the fairway. Specifically, it is likely to happen when you hit a short iron. If you look at the face after a short iron shot has been played, you'll probably see a spot where the grass became trapped between the face and the ball itself. The bits of grass left behind on the face will show you exactly where you made contact with the ball. Did you find the sweet spot? Or was the ball hit out toward the toe, or in off the heel? You may not have been able to feel exactly where the ball impacted the face of the club, but the grass evidence left behind will leave no doubt. Of course, when you are hitting a tee shot with your driver, there won't be any grass caught up between the face and the ball (there shouldn't be, anyway). However, that doesn't mean you are out of luck when it comes to evidence. In many cases, the tee you used to hold your ball up in the air will leave a mark on the sole (and sometimes the face) of the driver. If you look for the tee mark, you should be able to tell precisely where you made contact. Again, you'll be able to check if you hit the sweet spot, or if you missed on the toe or heel. To make it more likely that the tee will leave a mark, consider using painted tees rather than those with a 'natural' wood appearance. Once you have used the tee marking to evaluate your swing, you can wipe it off the club so you'll be able to repeat this process on future tee shots. By collecting this important bit of information after many of your swings, you should be able to take steps toward improving your swing mechanics. If you can consistently move the ball closer and closer to the sweet spot on most of your swings, your overall level of play is almost certain to improve. It's important to build good habits in your golf game. Since you repeat so many things you do in golf over and over again during the course of a round, positive habits can help you stay on track. For example, most successful golfers use a well-established pre-shot routine before every shot. By going through the same process of movements and thoughts prior to each swing, a golfer can get himself or herself into the right frame of mind to send the ball toward the target. The benefits of a pre-shot routine are well-recognized in golf, and you can consider this one of the most important habits a player can form. At the same time, you can create a 'post-shot' routine to improve your level of play, as well. This routine will be much simpler, as you don't want to waste much time before moving on to find your ball and play your next shot. We would suggest that you use the moments after each shot to evaluate your swing and check on the markings left on your club head. It should only take a moment to look down and check the markings, and you can probably do this as you are walking back to put your club away. Unfortunately, many golfers use the moments after their swing to get mad. If the ball isn't headed in the right direction, the average player may get upset and frustrated. Those are wasted emotions, as they aren't going to do anything to help you get better. Leave your frustration to the side and instead focus on the process of improvement. By gathering information in the moments after a failed swing, you can make it more likely that you'll avoid such a mistake on future swings. At first, you'll probably need to remind yourself to check on the marks which have been left on your club. That's okay – all habits take effort at first. Before long, you will realize that this action has become a natural part of your game, and you won't need to think consciously about it after each shot. Just like your pre-shot routine can become a built-in part of your game, so too can your post-shot routine become automatic. When you get to this point, you will be in a nice pattern of collecting data after each swing. Given enough time, adding this stream of information to your overall 'golf brain' will eventually make you a better player. Persistence is always important when trying to develop new habits. If you are just going to give up on this after a few holes, you might as well not even start. It will be tempting to give up shortly after starting this routine, since you aren't likely to see any benefits in the short term. You shouldn't expect to immediately play better golf just because you are checking your grass or tee markings. The gathering of this information is something you do with the long term in mind, not just the rest of your current round. Think about this step like you may think about putting money into your savings account. A single deposit may not look like much, but it can add up nicely over time. By consistently checking on these markings and depositing information to your bank of knowledge, you will have more to draw from down the line. Simply checking the marks on your clubs once or twice is going to do you no good at all. Every golfer hits bad shots, and no player ever strikes the ball perfectly on the sweet spot for an entire round. Even the best golfers in the world miss the sweet spot regularly, as it is tough to hit such a small target while swinging the club through at such a high speed. So, if you only check on your impact point from time to time, you won't gain enough information to draw any meaningful conclusions. If you are going to gain anything from this process, you need to be watching for patterns. It is when you start to notice patterns in your ball striking that you can begin to make valuable, accurate determinations about what is going wrong with your swing. For instance, you may find that a majority of your iron shots are struck in toward the heel of the club. Or, you may find that you tend to contact your drives out toward the toe. Whatever the case, it is when you begin to spot trends that you should start to think about making corrections. To help you notice patterns with your golf swing, we have offered a few tips below. Divide woods and irons. 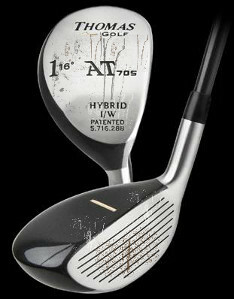 The swing you make with your driver and other woods is quite different from the swing you make with your irons. Therefore, you really shouldn't consider these two categories together when evaluating your ball striking. It's possible that you'll be making the same mistake across all of your clubs, but you shouldn't necessarily assume that will be the case. Keep these two categories separated mentally, and look to make improvements separately with each of these two different types of swings. Write things down. You might think that you'll be able to remember what your impact pattern looks like over the course of a round, but that's harder than it seems. A round of golf takes a long time to complete, and there is a lot which goes on between the first hole and the last. Consider adding a small notebook to your bag where you can jot down information about your ball striking. Just a couple of important details is all you will need for each shot. Write down the club you used, where you contacted the ball on the face (sweet spot, heel, or toe), and any other notes you feel are relevant. Then, at the end of each round, you'll be able to look back and look for patterns that can help you get better moving forward. Rule out awkward shots. You are faced with a variety of different kinds of situations when playing a round of golf. For instance, you may need to hit a shot where the ball is way below your feet, or you might need to play the ball out of a divot in the middle of the fairway. Whatever happens to be the case, you should always exclude these kinds of shots from the evaluation of your swing. When you find yourself in a tough spot, the goal is simply to move the ball out of trouble and up towards the target – it doesn't necessarily matter if you are able to hit the sweet spot. For the purposes of evaluating your swing, consider only shots hit from the tee or from reasonable lies in the fairway or rough. If there is a consistent problem with your golf swing, it shouldn't take long for that problem to be exposed on the course. Even after just one round, you may be able to notice a pattern with regard to your misses. After a few rounds, any pattern which is present will make itself obvious. Once you feel like you have enough data to draw an accurate conclusion, it will be time to work on fixing the flaws in your technique.